Are you ready for some completely unsubstantiated rumors? Here goes: Treyarch's unannounced, supposedly-in-Vietnam Call of Duty is reportedly titled "Black Ops" and will support dedicated servers for multiplayer. For a game that hasn't been officially announced yet, we sure do know quite a bit about Treyarch's upcoming Call of Duty 7 (or at least, we think we do). While nothing has been confirmed, the prevailing opinion is that the game will be set during the Vietnam Era - or, at the very least, the Cold War as a whole. Now, there's some new information that has apparently come to light. I need to stress that this information is 100% unsubstantiated, having first surfaced on MapModNews (where it claimed to be sourcing a story on Tek9 that to my knowledge hasn't been found by any sites covering this). These are rumors in the truest sense of the word, and I advise everyone to take them as the furthest thing possible from Gospel Truth (TM). But, they're interesting nonetheless. According to the supposed Tek9 report, Treyarch's Call of Duty 7 will be titled Black Ops, and while some might call it entirely too generic to be real, I'm going to point to the fact that Modern Warfare was pretty damn generic, too. 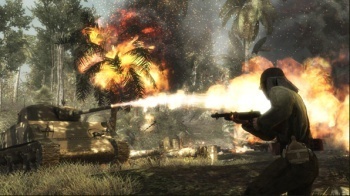 Black Ops will take place over a number of years from the ending of World War II onward with a focus on Cold War settings like Cuba, South America, and - of course- Vietnam. As with Modern Warfare, several missions will let gamers play as British SAS agents, one of which "pitches you in close combat during a mission in the Iranian embassy in London during the 1980's" (almost certainly Operation Nimrod). It's fairly standard stuff until you get to the end, where the report mentions that not only will Black Ops feature the popular "Zombies" mode from World at War (though presumably we can infer that they won't be Nazis this time around), but that the game will also bringing back dedicated server support for PC multiplayer. If true - and again, there's nothing to suggest that - it would be a very interesting break from the official line for Treyarch, which has been accused of following its "big brother" studio Infinity Ward a bit too closely. If Treyarch is reinstating dedicated servers after the well-publicized debacle surrounding their absence in Modern Warfare 2, what exactly does this mean? Many blamed publisher Activision for the choice to move from dedicated servers to a matchmaking service; would the industry giant really reverse its position, or does it mean that the studios have more autonomy than previously realized? Of course, all of this is just rampant speculation. We don't know if any of this is true, and given the source it is all rather suspect. In the meantime, hope for the best but don't act surprised if this was all some guy just pulling stuff out of his rear.